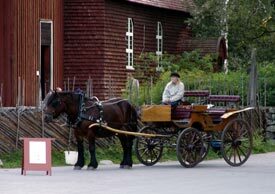 ABOVE: A horse and wagon pass the Seglora Church in Stockholm's Skansen open-air museum. INSET BELOW: A flower crown and a folk duet. Skansen, in the former royal park of Djurgården, has been one of Stockholm's most popular attractions since it opened in 1891 as the world's first open-air museum. And rightly so: It's a delightful collection of farm buildings, houses, workshops, and other historic structures from all over Sweden, displayed in naturally landscaped grounds where you'll also find traditional breeds of Swedish livestock, wildlife, and views of Stockholm Harbor. The name "Skansen" means "the fortress" in Swedish. In the early 19th Century, young Crown Prince Oskar and his friends had a miniature fortress atop a hill in the royal park where they played military games. The property was later acquired by Artur Hazelius, founder of the Scandinavian Ethnographic Collection (now the Nordiska Museet), who petitioned the crown for additional land that could be used for an open-air museum that would preserve Sweden's material culture and folklore. Skansen opened in October, 1891 with a single building, the Mora Cottage. Over the decades, the open-air museum has grown into a collection of more than 150 buildings from five centuries of Swedish history, organized by region and displayed in authentic settings. Costumed guides, artisans, and performers help to bring Sweden's rural heritage to life. Top inset photo by Beppe Arvidsson, lower inset photo by Marie Andersson for Skansen.